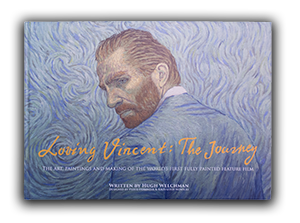 The European Film Academy has bestowed the prestigious 2017 European Animated Feature Film Award to Loving Vincent, as the film continues its successful release across the world. Co-directors Dorota Kobiela and Hugh Welchman accepted the award at the 30th European Film Awards in Berlin, Germany with a nod to Vincent van Gogh’s truly European background. The film has now won 13 Audience Awards so far including the Audience Award at the Annecy Film Festival, Sao Paulo Film Festival, Windsor Film Festival, Vancouver Film Festival and Oostende Film Festival. It has also received Best Animated Feature Awards at the Shanghai Film Festival and the Palm Springs Animation Festival. Elsewhere Loving Vincent has also been nominated for three Annie Awards; Best Independent Animated Feature, Outstanding Achievement in Music and Outstanding Achievement in Writing in an Animated Feature Production. The film is also nominated for Best animated feature at the Critics' Choice Awards and Best Animated Motion Picture at the Satellite Awards so keep your fingers crossed! Loving Vincent has now chalked up over US$ 20million in world-wide box-office. Find out more about your local release here.